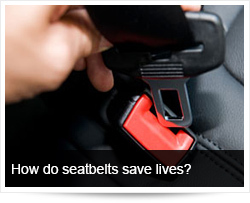 How do Seatbelts Save Lives? When you use the word seatbelt, people often think only of the "webbing." The black (or another colour) strap you pull across your lap and chest. The webbing - the thing you see most of - is not just any material. In order for it to be effective, it needs to be able to restrain you, it needs to be able to withstand enormous forces but it must also not be SO rigid that it can injure you. To this effect, the seatbelt webbing is slightly dynamic; it stretches a little under force. The fibres are finely woven in a way that allows them to move a bit. This makes the material soft (so as not to be uncomfortable), yet very strong. It must also be long-lasting and it must withstand sweat (acids) and exposure over a reasonably long period - typically longer than the life of the vehicle. The anchor points of the seatbelt system form a vital part of the system safety. Under the kinds of forces experienced in the full-frontal collision, these need to be and stay secure. When we examine a vehicle for seatbelt use or when we do a Technical Fleet Audit, we check that all the anchor points are secure, free of damage or wear and properly tied down. These are the points where the greatest forces are exerted and the best seatbelt system in the world will not function effectively if it is not properly secured and maintained. The seatbelt buckle has gone through a variety of evolutions. First, it was very much simply a latch system. But - after people got stuck in cars and burned to death, after elbows knocked the buckles, resulting in release and after people failed to be able to exit while hanging upside down because too great a force was needed to release it (among other things), seatbelts pretty much evolved to where they are today. The buckle release catch is now recessed (preventing elbows from releasing it), the release mechanism is designed better and the unit is designed to work even if the plastic melts in a fire. 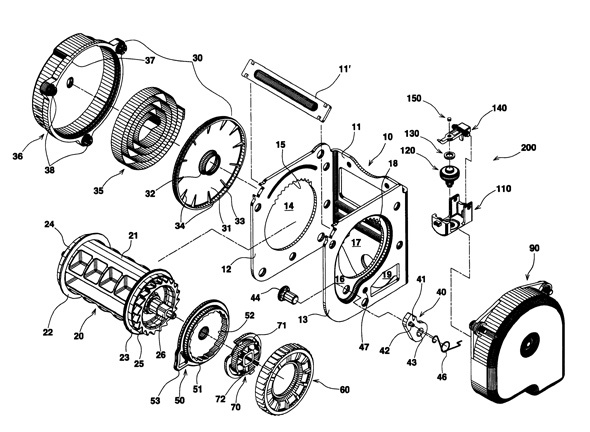 Essentially, the seatbelt is wound around a geared spindle. If you pull it gently, the gears will not engage and the seatbelt comes out. If you pull it hard, the gears will engage and the seatbelt will be held in place (and you know how irritating it is when you want to put on your seatbelt quickly, but it keeps "getting stuck," right?). Now - if there is a lateral or longitudinal force on the vehicle, this causes a little weight to shift and to engage the gears as well. Then the seatbelt will also lock in place. This is to allow you to be able to use it but for a roll-over or collision to result in restraint from the angular forces or from the rapid deployment of the seatbelt. Modern vehicles also have shackle sensors that allow the airbag deployment unit to determine if a seatbelt is worn. If not - the airbag will not deploy, since the occupant would not be restrained and will thus crash into the airbag. While some are very complex, this is basically a unit that will automatically "tighten" the seatbelt on impact. There are a variety of designs - some use a controlled "explosion" like an airbag while others use spring tension. This system is designed to ensure that the seatbelt is firmly and securely fastened around the occupant when a collision or roll-over occurs. It has been found that even in rear-end collisions, where this kind of system is not installed, occupants COULD be ejected out of the vehicle, towards the rear from underneath the seatbelt webbing - especially if their particular seatbelt design results in a slack belt system (too loose around the body). Finally, we can now get to the seatbelt (as a whole) and whether it saves lives, or not. Firstly, we need to understand that seatbelts are not "miracles." They have operational limitations. At higher speeds (say, beyond 80 Km/h), if you collide with a fixed object, the system could become part of the fatality mechanism. This is because the system is designed to reduce the RISK of injury or death, not PREVENT death in all its forms. The driver brakes. This causes the Lock-and-Pawl and associated systems to activate, locking the webbing in place. The occupants start to lean forward, and they are partially restrained by the seatbelts. The vehicle collides with an object. At the very first moment of impact, the front impact sensors engage and send a signal to the Airbag Controller Unit. The Airbag controller unit - now aware that a collision is happening, checks to see if the vehicle actually in motion. This is taken from inertial sensors elsewhere in the vehicle. The unit then checks to see if there are occupants in the front seats (there are occupant sensors in modern vehicles and this is why small children should not sit there since this could result in the system concluding there is no one there. It is also the reason why you need to disengage the Airbag in some vehicles when there is a baby seat there since the system might detect it as the presence of an occupant and deploy the airbag. - if the occupant even has a seatbelt on (in some vehicles). If all these conditions (this is a simplified explanation, so there could be many other considerations), the ACU deploys the seatbelt pre-tensioner and the airbag. Now the vehicle decelerates (rapidly, of course) but the occupant is still moving forward. Before the occupants reach the dashboard (if they were wearing no seatbelts) and collide with it, they "collide" with the seatbelt, which decelerates them (so, later than the actual collision, so the occupants' deceleration is now less, since they "lost their speed" over a longer time, already). But, the organs of the occupants are still in forwarding motion (most are largely liquid and thus deform, stretch and wobble inside the occupant) and reaches the front of the chest, where they "collide as well." But what if the forces are extreme? What if this was a collision with a solid wall, at 100 Km/h (or more)? Now that you understand the concept of delayed (or reduced) deceleration being the key to seatbelt design and its influence on survival rates, there is another issue to consider: The type of collision. In a side impact collision, the distance between the occupant and the vehicle (door/frame) could be as little as centimetres. Ignoring side-impact airbags for the moment, you will immediately see that - when a vehicle is struck from the side) the nearest occupant will take the full brunt of the collision almost directly. In these cases, the seatbelt will be ineffective, since it is designed to keep the occupant "in the seat," but the seat is right next to the door. So - for the purpose of survivability, seatbelts can have a little positive effect in side-impact collisions, unless the collision is from the far side and the forces are (again) not too great. In roll-over collisions, seatbelts help only by keeping the occupant in the seat (this is what the lap belt is for). But if the roof caves in, the seatbelt will not protect the head of the occupant. Equally - if a collision occurs where a vehicle (like a truck) penetrates into the cab of a lighter vehicle, the driver or occupants could be killed where they sit. In such cases, seatbelts are all but ineffective. But - fortunately, most vehicles are moving forward when collisions occur, so seatbelts STILL SAVE LIVES - but only if they are worn!